Whenever I see Violets along the trail I am reminded of their Love and Friendship. Earlier this evening a bad combination of key strokes triggered the publishing of my unfinished empty blog… instead of typing madly and waxing poetic this will be a “Wordless Wednesday with Wings” Blog. The photographs were taken on my five mile hike across/around West and Music Mountains in Hot Springs National Park. Spring is a chaotic rapidly changing slideshow of color. Wildflowers, Rocks, Birds, new Leaves and flowering Trees are glorious eye candy along the trails. Nature always has surprises waiting for me to share via my lens. Yesterday’s surprise was the return of a favorite hiking partner, a male Red-Bellied Woodpecker. His vibrant red head glowed in the sunlight high above me. Before the drought of 2012 it was rare not to see one every day I hiked, sometimes on every trail across Hot Springs and North Mountains. This sighting was beautiful gift. I hear Nature sing her ode to spring and am drawn into her arms. Her beauty is found in the tallest Trees and the tiniest sprouts. Spring is an awakening love rejuvenated after silent slumber. PS The sequester has limited the budget of our National Parks. In many ways this is a bad thing… on the other hand in Hot Springs Nationals Park it may be a good thing. Let me explain… our Park managers seem to view Wildflowers as weeds and they mow them down even on Earth Day. Thankfully since the budget cuts began the Wildflowers in many of the easily accessible tourist locations are flourishing. Wildflowers are NOT weeds, they are beautiful and visitors would LOVE to see them. I say let them grow and paint the park. A manicured lawn is boring, a lawn with wildflowers creates beauty, attracts Butterflies and smiles. I am also thankful they announced they will not be grooming the trails during the sequester. Let the Forest have the opportunity to grow and flourish, the Wildlife will appreciate the extra food. I always feel cheated when I go for a hike and it looks like the edges of a city sidewalk instead of a wilderness trail. PPS For those of you who Love Rocks (like me)… The mountains in Hot Springs National Park (Hot Springs, North, West, Sugarloaf, Music and Indian) are part of the Zig Zags which are the end of the Ouachitas. 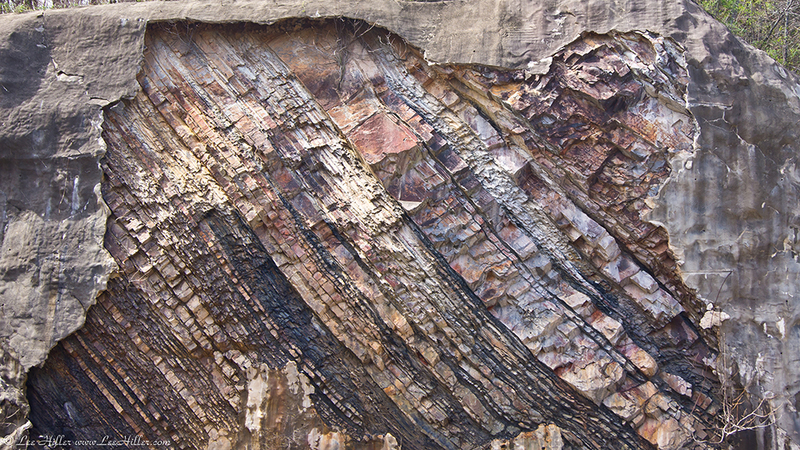 They were formed when the earth rolled a million give or take years ago and we have the cool diagonal layers you see in the image below. When you hike you will see a spectacular array of rocks including Crystal, Sandstone, Tufa, Novaculite etc… and the occasional Diamond too! It rained for two days feeding the parched land across Arkansas and Nature is painting every surface with new life. 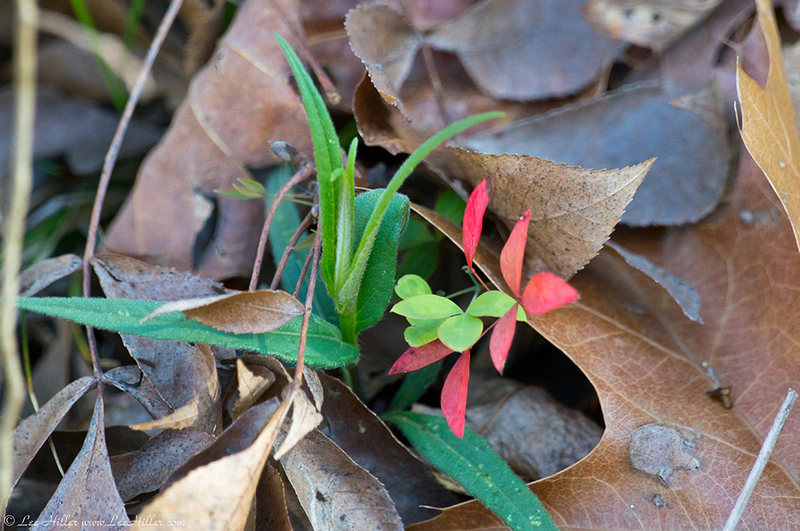 In Hot Springs National Park the Forest reveals the delicate unfurling of spring Leaves. Soft green pods slowly opening to release green fronds from the sleeping sentinels. A tiny Titmouse flits from Tree to Tree stopping to sharpen its beak on a branch above me. Rain dampened Rocks create a soft pallet of colors on the surface of the trail cradled in fallen Leaves and Needles. Tiny Bluets create a purple haze hovering on willowy green stems above the rust colored Forest floor. Flowering white Wild Plum Trees call to winged pollen collectors with their glorious blossoms. Question Mark and Variegated Fritillary Butterflies Spread orange wings wide warming in the afternoon sun.